353 Commonwealth is located on the north side of Commonwealth, between Hereford and Massachusetts Avenue, with 351 Commonwealth to the east and 355 Commonwealth to the west. 353 Commonwealth was designed by architect G. Wilton Lewis and built in 1894-1895, one of three contiguous houses (349-351-353 Commonwealth) built and owned by carpenter and building contractor Luther Moore Merrill for speculative sale. He is shown as the owner on the original building permit application dated April 23, 1894, and on the final building inspection report dated March 8, 1895. The three houses are designed as a single unit centered on a palladian window. 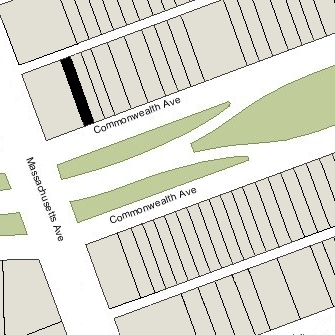 Click here for an index to the deeds for 353 Commonwealth, and click here for further information on the land on the north side of Commonwealth between Hereford and Massachusetts Avenue. On June 1, 1895, 353 Commonwealth was purchased from Luther Merrill by Miss Eleanor Stanley Parker. She also maintained a home in Nahant. In 1898, she was joined briefly at 353 Commonwealth by attorney Francis Reginald Bangs and his wife, Anna Dummer (Anderson) Bangs. They had married in December of 1897 and 353 Commonwealth probably was their first home together. Before their marriage, he had lived at 240 Beacon with his mother, Anne (Annie) Outram (Hodgkinson) Bangs, the widow of Edward Bangs. By the 1898-1899 winter season, Francis and Anna Bangs had moved to 42 Fairfield. During the previous season, 42 Fairfield had been the home of Eleanor Parker’s brother, Francis Stanley Parker, and his wife, Harriet Amory (Anderson) Parker, who was Anna Dummer (Anderson) Bangs’s sister. Eleanor Parker continued to live at 353 Commonwealth until about 1901. During the 1899-1900 winter season, she was joined by Elizabeth Gardiner (Stone) Bacon, the widow of William Benjamin Bacon, Jr., who had died in September of 1896. In June of 1900, at the time of the 1900 US Census, Eleanor Parker was living elsewhere and 353 Commonwealth was the home of Louis Stone Greenleaf, an electrical engineer, and his wife, Margaret (Adams) Greenleaf. He was the nephew of Elizabeth (Stone) Bacon, son of Richard Cranch Greenleaf and his wife, Adeline Emma Stone (Elizabeth (Stone) Bacon’s half-sister). Eleanor Parker resumed living at 353 Commonwealth during the 1900-1901 winter season, but moved thereafter. During the 1903-1904 winter season she was living at the Hotel Victoria at 273 Dartmouth and by the 1904-1905 season she was living at Haddon Hall at 282 Dartmouth. By the 1901-1902 winter season, 353 Commonwealth was the home of banker William Pratt Lyman and his wife Helen (Beeckman) Lyman. They had lived at 435 Beacon during the 1899-1900 season. They also maintained a home in Nahant. They continued to live at 353 Commonwealth in 1903, but had moved to 528 Beacon by 1904. During the 1903-1904 and 1904-1905 winter seasons, 353 Commonwealth was the home of Miss Katharine E. Silsbee. Her primary residence was in Beverly. On February 28, 1905, 353 Commonwealth was purchased from Eleanor Parker by Anna Dwight (Whiting) Howard, the widow of William Henry Howard. Her mother, Rebecca (Bullard) Whiting, the widow of Nathaniel Whiting, and two of her children, Frances Sargent Howard and John Kenneth Howard, lived with her. They all previously had lived at 209 Beacon. William Henry Howard had died in October of 1901 in San Mateo, California, where he was a major landowner and cattle rancher. His father, William Davis Merry Howard, had gone to San Francisco from Boston in 1839 as a cabin boy and then served for several years a supercargo on Boston ships trading on the Pacific Coast. In the 1840s, he became a merchant in San Francisco, where Howard Street was named in his honor. William and Anna Howard had five children: William Davis Merry Howard, Gertrude Howard, Edward Whiting Howard, Frances Sargent Howard, and John Kenneth Howard. William D. M. Howard was a mechanical and mining engineer in California and Oregon. He married in December of 1911 in Snohomish, Washington, to May Agnes Caldwell. By 1920, they lived in the Auburndale section of Newton. Gertrude Howard married in November of 1893 to Frederick Silsbee Whitwell, an attorney and real estate investor; they lived at 166 Marlborough. Edward Howard lived in San Mateo, where he managed the Howard family properties as co-executor of his father’s will. He married in June of 1905 to Olivia Lansdale. Rebecca (Bullard) Whiting died in April of 1906. Anna Howard continued to live at 353 Commonwealth with Frances and John Howard. During the 1907-1908 winter season, it also was the home of Eugene Van Rensselaer Thayer, Jr., and his wife, Gladys Baldwin (Brooks) Thayer (both Mrs. Howard and the Thayers were listed there in the 1908 Blue Book). The Thayers also maintained a home in Lancaster. He was an investment broker and later would become president of the Merchants National Bank in Boston and then president of Chase Manhattan Bank in New York. By 1909, the Thayers had moved to 164 Marlborough. During the 1908-1909 winter season, Anna Howard was living elsewhere and 353 Commonwealth was the home of Francis Augustus Shea, a bachelor. His mother, Elizabeth (Eliza) (Dooley/Dorley) Shea, the widow of Francis Patrick Shea, and his unmarried sisters, Caroline J. Shea and Helen E. Shea, lived with him. They previously had lived at 22 Peterborough. He was president of the Reece Button Hole Machine Company, founded by his brother-in-law, John Reece (husband of Marietta Shea), who died in March of 1896. 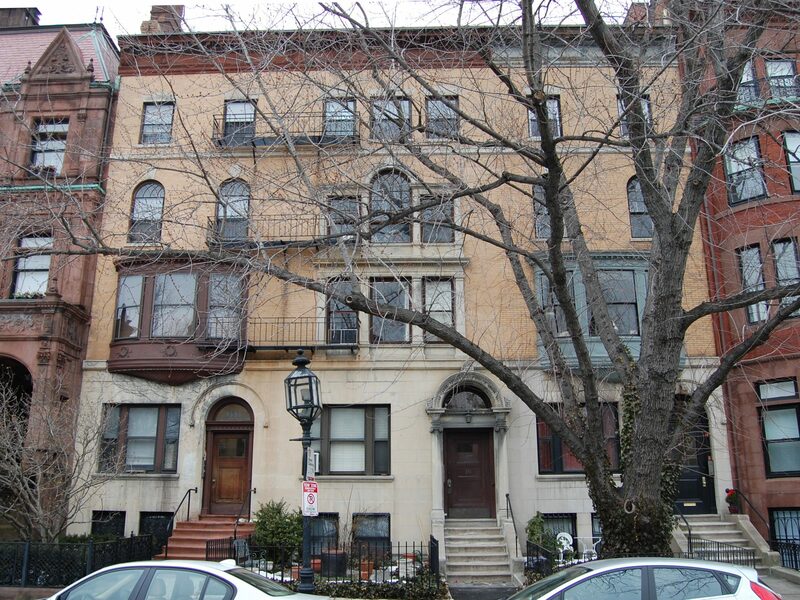 By 1910, the Sheas had moved to an apartment in The Puritan at 390 Commonwealth. Elizabeth Shea died in June of 1910, and by 1912 Francis Shea and his sisters were living at 232 Commonwealth..
By the 1909-1910 winter season, Anna Howard was once again living at 353 Commonwealth, but during the next season it was the home of dry goods merchant Henry Coffin Everett and his wife, Ellen Crocker (Tufts) Everett. They had lived at 283 Commonwealth in 1910. By the 1911-1912 winter season, the Everetts had moved to 49 Commonwealth and Mrs. Howard was living at 353 Commonwealth again. She also maintained a home in Manchester, Massachusetts. In January of 1915, her son, Edward Howard, died of injuries suffered in an elevator accident at the California-Pacific Building in San Francisco. Anna Howard and Frances Howard moved to California in the fall of 1915, but also continued to maintain 353 Commonwealth as their Boston residence. Anna Howard died in July of 1916 in San Mateo. Frances Howard continued to live in California. John Kenneth Howard graduated from Harvard in 1915 and moved temporarily to California with his mother and sister. He married in Boston in June of 1915 to Ruth Gaston. By the 1915-1916 winter season, they had made 353 Commonwealth their home. Anna Howard died in July of 1916 in San Mateo. In her will, she left 353 Commonwealth to John Howard. John Howard graduated from Harvard Law School in 1917 and then served as a US Army Captain in France. 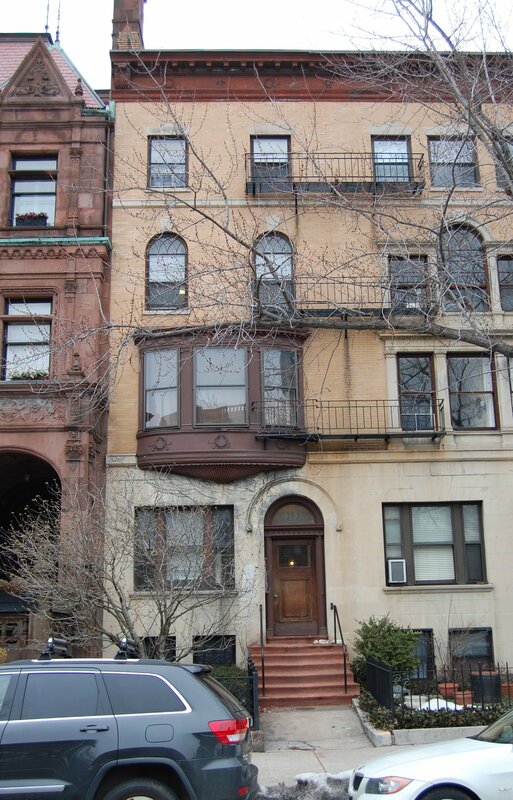 He and his wife continued to live at 353 Commonwealth during the 1917-1918 season, but moved thereafter and by the 1919-1920 season were living at 208 Beacon. During the 1918-1919 winter season, 353 Commonwealth was the home of Paul Drummond Rust and his wife, Florence R. (Stuart) Rust. They had lived at 135 Beacon during the previous season. Paul Rust was an investor in timber lands, wholesale lumber dealer, and investment banker and broker. They continued to live at 353 Commonwealth during the 1919-1920 season, but moved thereafter to 415 Commonwealth. On October 18, 1920, 353 Commonwealth was purchased from John Kenneth Howard by real estate dealer William J. Stober, and on March 18, 1921, it was acquired from him by Stanley W. Lovejoy, a real estate dealer associated with the Professional Building Co., Inc. In April of 1921, he filed for permission to convert the property from a single-family dwelling into doctors offices and a single-family dwelling. On September 7, 1921, he wrote the Building Department to indicate that he was withdrawing application to convert the property “from a residence into an office building.” The application was marked abandoned, but then that indication was crossed off and a permit was granted in November of 1921. By 1922, 353 Commonwealth was composed entirely of medical offices. On June 12, 1922, the Professional Building Co., Inc., acquired 353 Commonwealth from Stanley Lovejoy. At the same time, it also acquired the Empire hotel at 333 Commonwealth. It also owned the Tuileries hotel at 270 Commonwealth. 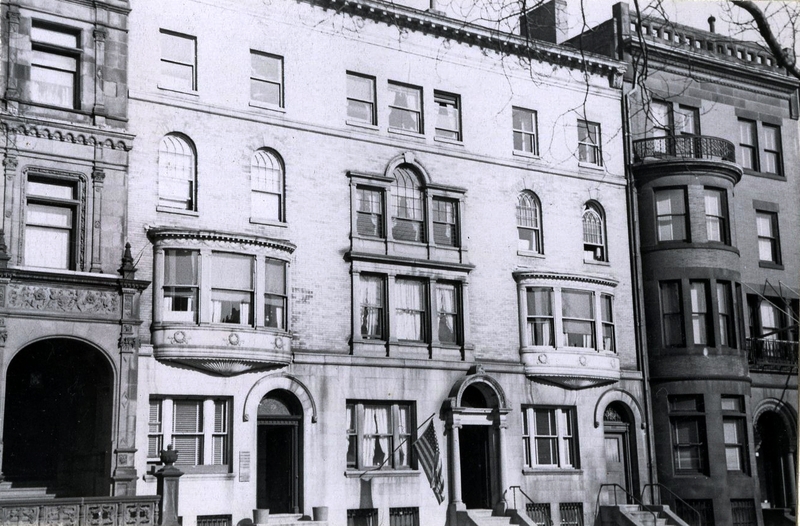 On November 14, 1922, 353 Commonwealth, 333 Commonwealth, and 270 Commonwealth were acquired from the Professional Building Co. by the Commonwealth Home and Office Trust, the trustees of which were Russell S. Codman (trustee of the Central Building Trust and other concerns), Allan Forbes (president of the State Street Trust Company), and Leavitt C. Parsons (president of Marshall & Co., Inc.). On September 6, 1934, the City Institution for Savings of Lowell foreclosed on its mortgage to the Professional Building Co. (which had been assumed by the Commonwealth Home and Office Trust) and took possession of 353 Commonwealth. On February 1, 1937, 353 Commonwealth was acquired from the City Institution for Savings of Lowell by Dryco Properties, Inc. (Carl Dreyfus, president). The property changed hands, remaining medical offices and one apartment for the building superintendent, and on September 14, 1962, was acquired Archibald H. Ferran and his wife, Dora (Buckman) Ferran. On September 26, 1962, they transferred the property to themselves as trustees of the Wesco Realty Trust. In May of 1972, Archibald Ferran filed for permission to convert the property from a single-family dwelling and medical offices into five apartments and medical offices. He subsequently abandoned the permit. On July 18, 1972, 353 Commonwealth was acquired from the Ferrans by Andrew Saggese, Jr., trustee of the Drew Realty Trust. On May 24, 1978, 353 Commonwealth was acquired from Andrew Saggese by Dana M. DeLuca and his wife, Susan J. (Bordewiek) DeLuca. On June 15, 2004, they transferred the property to themselves as trustees of the Commonwealth Realty Trust. 353 Commonwealth remained an apartment building in 2017.